PHOTO BY MATT DETURCK The Vacuum Oil site. It's difficult to view the abandoned campus in the Flint Street area of southwest Rochester and not see the possibilities, as well as the clearly daunting challenges. 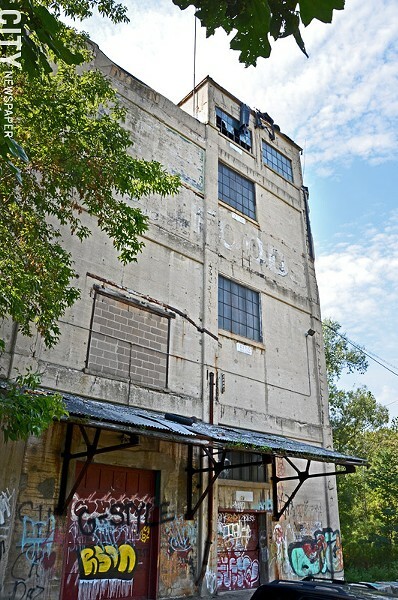 The 25-acre industrial ghost town is on the western bank of the Genesee River between the Ford Street bridge and the recently reopened railroad bridge crossing. It's secluded, spacious, and the riverfront view is wide open and gorgeous. "You can envision this being a kind of stunning place," says Mark Gregor, manager of environmental quality for the City of Rochester. "We think it has huge potential." But the buildings on the former Vacuum Oil site, largely untouched since the refinery closed in the 1930's, are falling apart and defaced by graffiti. And the site itself is covered in debris and plagued by environmental issues. "This is the last stretch of the Genesee River south of downtown that has not reached its potential both as a recreational asset and from the standpoint of development," Gregor says. The city, working with concerned neighborhood groups, has put together a long-range master plan for the site. It includes residential and mixed-use development, amphitheater, grocery store, water access, streetscape improvements, and more projects phased in over many years. But the challenges are significant. The extent of the environmental damage from the site's former refinery and junkyard hasn't yet been determined, for example. "We haven't really done an exhaustive investigation of the nature and extent of contamination," Gregor says. "There are areas that we don't even know if there is significant contamination." The city will need the cooperation of the ad hoc group of current and former owners to determine who is responsible for what and what role each will play in the redevelopment of the site, he says. "The numbers are going to be very large," Gregor says, "and that's one of the biggest hurdles we have: the funding for environmental cleanup and demolition, as well as new street infrastructure. It's big money."